"Liberty Petroleum represents a quality brand and a quality image. After over 40 years as a branded jobber, the Liberty brand successfully 'liberated' me from major oil." "I have been in this business for over thirty years and have never had such a positive bottom line in my service station P&L statement. 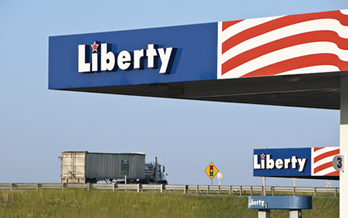 Liberty gave me the tools to expand my customer base and increase my fuel sales—which has translated into enhanced profitability." "Choosing Liberty as one of our suppliers has been one of the best decisions we have made. They have turned out to be a great partner with lots of great attributes from their crisp, clean, image to their competitive supply. We have become more knowledgeable and more profitable in our fuel buying as a result of our relationship with Liberty." "King St. is my second Liberty station that has blown away all of my partner's and my sales projections. Customers love our patriotic image and come back for our low prices. We have tripled our volume after converting from a major brand, and our margins are consistently excellent. I can't ask for anything better." "Liberty's image is first class and affordable. We receive many comments about the sharp, clean look at our Liberty stores. Our dealers appreciate the affiliation with a brand that is recognized by customers and associated with quality, service, and value. The staff at Liberty has added value to our efforts that operators new to the brand have really appreciated." "I have always felt that pricing has been my biggest issue with retailing gasoline. Liberty gives me the opportunity to compete on a daily basis. My customers continue to patronize my location because of this along with offering top quality fuel. The credit card program also provides me with the most competitive rates in the industry. Bottom line, Liberty provided a beautiful patriotic presentation and provided me the peace of mind to price competitively with anyone on my street daily." "The pricing contract and supply you can count on are very important to us, and Liberty delivers. When there are issues to be solved, the support we get is second to none." "Liberty Petroleum LLC and Ewing Oil Company have made the past 13 years of our 38 years in business a pleasant customer experience as compared to the first 25 years of being treated as an under paid major oil company employee." "We trust Liberty. This organization was put together by jobbers for the mutual benefit of other jobbers." "The trust in the Brand as well as the knowledgable staff has sold me on Liberty. Pricing is key to survival in retailing gasoline and diesel, and Liberty is competitive every day. Their program has always allowed me to maximize my profits while offering a top-quality product. The company is extremely supportive to answering any questions that I might have." Distributors from around the country are joining the team.